Shopping in Malta can be a great experience. There are shops or markets for everyone, from international brands to those selling Maltese items to take home as souvenirs or local food products. Other than that, shopping in Malta gives you one more opportunity to take a rest in one of the many cafés that are a part of the Maltese way of life. 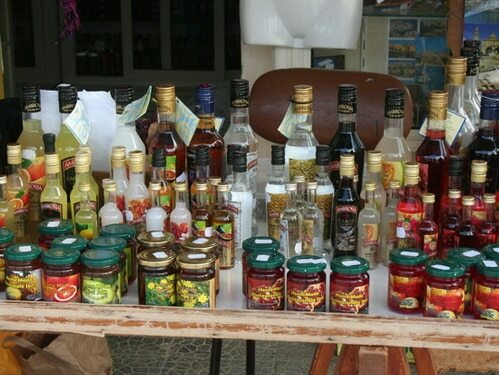 Markets are the best place to enjoy the real Maltese essence. Besides great shopping, you get a cultural flavour of Malta in these places where locals meet to socialize and buy daily products. Almost every town and village has its market. So, you can’t miss it. In the markets of Malta you will find assorted items like household goods, clothing, music, toys, etc. For bric-a-brac, visit Il-Monti market, just outside Valletta’s city gate, on Sundays. Still in Valletta, there is a daily market in Merchant Street where you can shop for more mainstream products. Near Cospicua, one of the Three Cities, there is a nice weekly market on Tuesdays. Outside the capital, Marsaxlokk fish market is a must, with its strange and exotic fish. To go there, you can even join an early morning trip organised by tour operators. 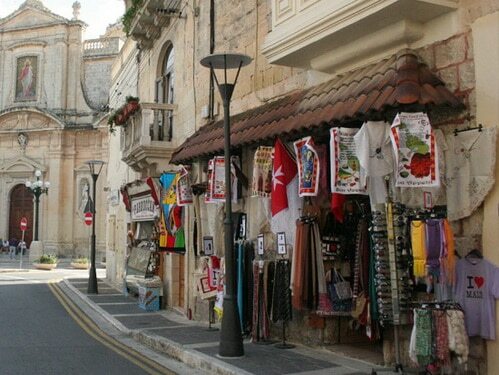 In Gozo, visit the charming it-Tokk market, held daily in the main square of Victoria. This is the perfect place to go shopping for Maltese delicacies. People in Malta like to eat and drink. One of the reasons is that Maltese food and wine are so delicious. After you taste the food, you will want to buy some to take home. Among others, choose sun-dried tomatoes, sun-ripened olives, fresh figs, capers, the famed cheese and some wine. Go shopping for food products in the local shops, as well as super, mini or street markets. You can also find specialties in Cittadella and Victoria shops. Wines can be bought at the excellent Maltese wineries. Malta’s crafts and jewelry have a tradition of worldwide reputation because of the quality of the detail achieved by Maltese craftsmen and jewelers. 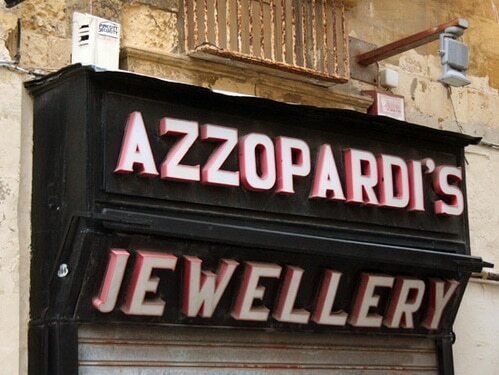 Whatever you prefer, you can afford it because jewelry and crafts in Malta fit every budget. Check out the beautiful silver and gold filigree broches, bracelets and earrings of classic designs. The Maltese silverware is an important part of the country’s patrimony and collectors tend to look for these items in international auction rooms. Dating back to the days of The Order of the Knights of St. John of Jerusalem, this craft has produced some of Europe’s finest ware. Today, all silver and gold products are certified for authenticity and hallmarked accordingly by the Maltese Government Consul. Also look for the traditionally handcrafted glass produced throughout the Malta. Only some factories are open for visits but shops can be found easily in the main island of Malta or in Gozo. Vases and figurines are among the most popular objects, usually swirled with lines that are inspired by the colours of the warm crystal blue waters of the Mediterranean and the landscape of brown hills with olive groves, cactus plants and springtime wild flowers. You can find a nice souvenir in pottery as well. The variety of practical items for the house and decorative objects is immense. Basket ware and wickerwork are Maltese crafts with a practical purpose too. Among numerous small items, go shopping for Hasiras, cane blinds used on doors and windows to cut out the hot summer sun in Malta. Fine lace is quite famous in Gozo and there has been an effort to recuperate this ancient tradition. Walking around some cities and villages, you will probably see women sitting outside on doorsteps working the bobbin. Hand-knitted woolen garments of colourful and classic designs make a good buy and you will always remember they came from Malta. Specially if you have seen them displayed under the hot summer temperatures. Woven wool rugs in cream and white are also available. Not exactly traditional, Maltese buses have become quite popular with tourists. They came in badges, plaques and metal and pottery miniature models. In Valletta, the Ta’Qali crafts village is the place to shop for crafts. You will surely find something for you in all the stalls and shops where you can watch craftsmen work live. But you must also go bargain hunting in Santa Lucija Street, Republic Street or in the side alleyways. When you decide to take the ferry to Gozo, head to the Cittadella Crafts & Shopping Center (Victoria) and the Ta’Dbiegi Crafts Center (San Lawrenz). But you can check many other small shops in Gozo. They aren’t hard to find. These are safe places to go shopping for the real Maltese crafts and jewelry. In other places, if you have doubts about authenticity, call the Malta Crafts Center in St. John’s Square (Valletta) or visit it to watch the local crafts displayed and gather information on where to buy them. Malta also has a reputation for its excellent antiques, which is easy to understand since we know these islands were home to many nobles from the 16th to 18th century. You can contemplate the finest pieces in the Maltese museums and palaces open to the public. Make a visit to Palazzo Parisio, Naxxar and Casa Rocca Piccola (all in Valletta). The most extraordinary antiques in Malta are furniture, silverware, maritime prints, art, Maltese clocks and gems. You will find them in antique shops in almost every town. Some have finer items, while others offer interesting bric-a-brac. But you can find the items in the open-air markets mentioned before in this page on shopping in Malta. Being the capital of Malta, Valletta has many shopping malls and arcades, specially along Republic Street. This is where you can shop for designer brands, fashion, music and the like. The most popular tourist areas, Sliema and St Julian’s, also have this international-style shopping at reasonable prices. Shop for music, fashion, perfumes, shoes, sports, interiors and all sorts of articles or sit at fast-food outlets, restaurants and cafés. The place to look for some Maltese art is Valletta. Find The Center for Creativity at St. James Cavalier, The Museum of Fine Arts or the local art foundation Fondazzjoni Patrimonju Malti to visit the exhibitions and buy a piece. Throughout Malta you will discover many private galleries too.